New data from Nielsen shows that traditional TV use continues its steady decline. It also shows that the connected television is picking up much of live TV’s losses. Nielsen says that the average adult watched 29 hours and 12 minutes of live television per week (4 hours and 10 minutes per day) in Q1 2018. Viewing has declined 4% since Q1 2017 and 8% since Q1 2016. Time-shifted viewing, primarily through a DVR, made up some of live television’s losses. The average adult watches 4 hours and 13 minutes, up 11% since Q1 2016. Over the last two years, live TV viewing has declined 2 hours and 4 minutes while time-shifted viewing has increased by 24 minutes. Young people between 18 and 34-years-old watch the least live+time-shifted TV; 2 hours and 17 minutes per day. Those over age 65 watch the most; 7 hours and 42 minutes per day. Nielsen’s data is averaged over all adults, whether they have the technology or not. The difference between live TV users and the average is not great (2%.) However, for other less adopted devices, the difference is much larger. DVR’s are in about half of U.S. homes. The average DVR user watches almost an hour per day of time-shifted TV versus 36 minutes a day for the average adult. Over the last two years, much of the TV time lost has transferred to the streaming media player, according to Nielsen’s data. The average adult watched 3 hours per week on devices such as Roku and Apple TV in Q1 2018. Usage has increased by 96% since Q1 2016, up 1 hour and 29 minutes per week. Traditional TV lost 2 hours per week over the same period. Nielsen says that streaming media players reach 36% of the US population. The average streaming media player user watches video with their device for 8 hours per week (1 hour and 8 minutes day.) Roku reports that the average daily streaming usage for each of its 20 million active users is 2 hours and 40 minutes. Nielsen does not measure video streaming to smartphones directly. It monitors time spent in apps whose primary function is video streaming. The company counts Netflix and YouTube activity in this total but not Facebook and WSJ activity. However, the data is useful in assessing how much video activity is increasing. The average adult spent 1 hour and 7 minutes per week in video apps during Q1 2018, a 43% year-over-year increase and 191% increase over Q1 2016. 18 to 34-year-olds use the smartphone for video the most. The average person in that age range spent 1 hours and 45 minutes per week using the apps in Q1 2018. Those 65 and older used video apps on the smartphone the least; just 24 minutes per week. Nielsen says that 58% of the adult population use smartphone video apps and that the average user spends 1 hour and 56 minutes with the apps per week. Nielsen data shows the average adult in the US is watching 8% less live TV than two years ago. Most of the viewing losses for traditional TV transferred directly to the connected TV. Younger people watch a third of the television as the old and three times as much on connected TVs as the old. May I ask you to explain where it states in the 2018 Nielsen Total Audience report that “the average adult in the US is watching 8% less live TV than two years ago” as you have stated in your article? 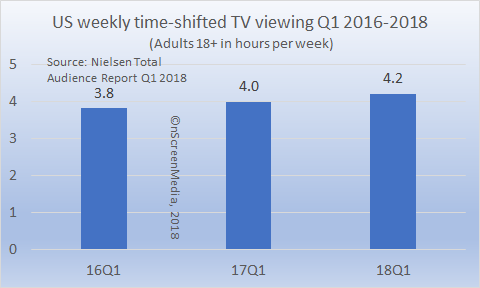 Per their chart on page 4, the average time for adults viewing live TV has increased by 16 minutes or 6+% since Q32017 (from 3:54 to 4:10). The study does not appear to compare anything to 2 years ago. It doesn’t state that in the report. I tend to focus on the tables, which are given below the Nielsen commentary. If you look there you will find it says A18+ watched 33:22:00 of live+timeshifted in Q1. 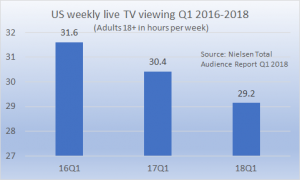 Looking at the Q1 2017 numbers, average adult watched 34:25:00. Also, I remove the timeshifted portion to get at the live portion. Doing the subtraction shows that in Q1 2018 average adult watched 29.15 hours per week versus 31.62 in Q1 2016. That’s a 7.8% decrease. Hope that answers your question. Oh, one other thing. People typically watch more when its cold. So, I would expect higher viewing in Q1 versus Q3. Everyone is out having fun in the sun.